The kandaleru left canal irrigation, along with the southern canal of the Somasila, The plateau became a parallel to the Delta zone. 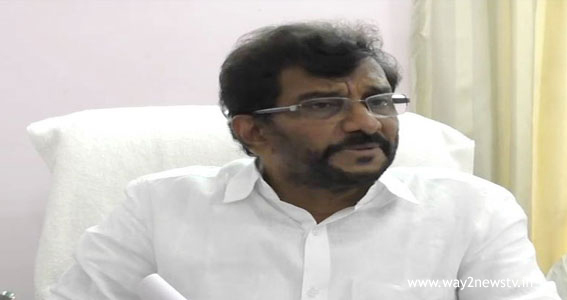 Though the Northeast monsoon has not affected, State Agriculture Minister Somireddy Chandramohan Reddy said irrigation water would be given to 7 lakh acres in the district. On Wednesday, he examined Thoderu,Biradavolu ponds and fields. Talked to the farmers there. On the occasion, the farmers were honored by the minister, who was worn by the Kandaleru, The minister said that this is possible with the rest of the Krishna water and the full water management. One acre crop would not even dry up. Weed water is also supplied to the late wet under the Thoderu small pond. The minister said that he is very happy to see the ponds in the Podalakur mandal. Degapudi-Bandepalli link will soon be sanctioned for the construction of Canal. They were set up grain purchase centers to give the cost price of grain for the farmers.